‘This is a city where four seasons can occur in a single day,’ our guide said, showing us Istanbul. And so at once I thought of it as the City of Four Seasons. The weather changed from day to day, that is true, although we did not experience the gamut of changes that are possible. It was the time of year when we can anticipate change from day to day. And so it proved. We had come from the cold of an English early April into the warmth of the south. Or so thought. The following day was as cold as the clime we had left. Rain was forecast, although none appeared that day. ‘You can expect anything,’ we were advised. It is not the weather that defines Istanbul, however. The seasons refer also to states of mind. Once the capital of a European empire, Constantinople changed name and identity when the Ottomans ruled their Islamic empire from Istanbul. It is a city uniquely situated in two continents, a city at the centre of the world. So much history passes through. East meets west, especially when we remember the Orient Express terminated here. Go north and you reach the Armenian border [that was the old Czarist Empire, then a republic in the Soviet Union.] Go south and you pass into Syria. Here is a city that shifts position, a city that changes nature, a city that speaks one language, then another. It is indeed a city of all the seasons. The traditional style of building is in wood, with chalet-like gables. The houses rise up the hills so that in position as well as style the westerner is reminded of San Francisco, although of course the resemblance is the other way round. From vantage points we see a bridge span the bay. It is the ubiquitous mosques that firmly locate us here and not there. Conservation demands that in the old city the traditional style of wood continues. Fire, of course, is always a risk. Cities that may seem so firm and immovable are subject to the vagaries of nature as much as they are to the willed destruction of human enemies. Istanbul has known fire as well as conquest. The mosques, built of stone, are capable of withstanding much. The mosques are everywhere, with their distinctive central domes and minarets at each corner of the boundary walls. Everywhere you hear the call to prayer throughout the day and night. You soon become accustomed, sleeping through the long, loud insistent appeal to the faithful. The language is Arabic, not Turkish, the language of Islam. Are the Turkish fluent in Arabic, we wonder? No, but they learn the prayers by heart. Belief often has a language of its own. Faith seeks to be integral to daily life, yet set apart by its dignity, its reverence, its sense of the sacred. Before entering the mosque we must take off our shoes. The floors are covered with deep piled Turkish carpets that soften the noise of walking feet. A mosque is a place of quietude that adds to the sense of being a place where one may understand the mysteries of the divine. ‘God is great’ reads the familiar exhortation in Arabic script positioned at various points in this house of worship. The absence of images is a feature of Islam that others may notice at once. Patterns of great beauty decorate the walls, but there are no statues. There are no votary candles. There is no altar. The believer’s eyes are turned towards Mecca, but within the mosque there seems to be no one focal point. Sacred texts may surround the worshipper, but there is no symbol that is especially revered. The air is free of incense and music. What other faiths see as guides towards an understanding of the mysteries are to Islam impediments and diversions. Purity is at the heart of Islam. The faithful cleanse their bodies [as the house of the spirit and the soul] before prayer. Cleanliness is woven into the fabric of Islamic life. There is always someone sweeping the streets of Istanbul, and doing so with pride. The streets of other Islamic cities are tidy, but none seem as clean as Istanbul. This is another culture, perhaps a less forgiving one than the West, but ritually devout in a way few Western believers are in our overwhelmingly secular concerns. Charms against the Evil Eye are much in evidence. Westerners may be inclined to dismiss as superstition what is to the Turks a presence they dare not ignore. Evil is real enough, especially in a time of war when the enemy is amassed on the borders and has begun to attack. As I write the battlefront is far from the city. But this is in a nation at war. War violates the mind as well as the body. Water cannot wash away the stain. Clean water has been a concern of the city for many centuries. A visit to the ancient cistern is like a visit to a mythic Underworld, a feeling emphasized by the sculptured head of Medusa. She it was whose terrible aspect turned those who met her gaze to stone. In the Classical world her image was used as a ward against evil. She purifies the water, as do the carp who swim about, eating up the impurities. The cistern waters are decorative and of historical interest now, but the carp continue to swim. Istanbul is a city defined by water because its parts are separated by water. But the Bosporus is not merely a channel: it is a border between continents. If you cross to the Asian side you will not find, as visitors have been known to anticipate, signs of an Asiatic culture. It is the same city in the same country. Hindu temples and Chinese restaurants do not replace the Turkish identity of Istanbul. There is, however, a difference across the water. It is much less expectant of tourists. The merchants do not volunteer to speak in English. Some may suppose that the visitor is in fact Turkish. You will not be pestered when you linger at a market stall because you are not the gigantic euro or dollar sign that tourists in touristic places are seen to be. You can wander, absorbing the real life of this busy, crowded, commercial heart of a city founded on the opportunity to supply the traveller’s wants. The Orient, as it was once to Europeans, begins here. Therefore it ends here also. Istanbul was the last staging post of the Silk Road before the traveller crossed into Europe. It is not too far to the Greek border, for this city is also ancient Byzantium. East fades into West. Whereas, for the European, it is the prospect of Asia, of the East, of the Orient [that now-discredited word] that Istanbul offers. Orient is a word discredited because of its patronizing connotations. An aura of the romantic vies with a suggestion of luxury and decadence. The Mysterious East is a cliché encompassing a vast continent with many cultures and so many histories. So much diverse experience cannot be described in a single phrase. Many such experiences of them meet here. A current experience is the outpouring of refugees from the cruel and devastating civil war in Syria. The world is accustomed to war, but the millions who have fled and the images of destruction they have left behind will leave lasting impressions on the world’s conscience. We met A at the travel agency where we made enquiries. He was fluent in English and in German, having lived in Germany for a while. He had French too. His Turkish was limited. [He spoke English to his colleagues.] A had fled Palmyra in Syria, a town once favoured by travellers seeking Arabian antiquities. A had been proprietor of a hotel. That was gone. Everything was gone. [We dared not ask about his family.] Now he had to begin a new life. In return for bed and board he helped out at the travel agency. When his Turkish is better he will manage a hotel no doubt. Even today his story is happier than many. The war is physically distant but close in the minds of everyone here. It is also in the minds of many who are not here because they have chosen other destinations. Visitors are welcomed with an unmistakable sense of relief and gratitude. There are many visitors from other parts of Turkey, but Americans and Europeans are so few even as the customary tourist season begins. Fear is powerful. Although there have been recent terror attacks in Western Europe, in Western minds the fear grows the closer one comes to the war zone and the rapacious, merciless armies fighting for absolute master of the situation. The mysteries of the East turn into the realities of a world in conflict. Is the reality in Istanbul fear? Few will talk openly about the government with its policies of intolerance and dominance. As for the possibility of terror, it is no more a reality here than in Paris or Brussels, Berlin or London. ‘Rather than fear there is a lot of hope,’ I hoped to write, but events since then have increased the fear. As for the hope, it remains but more threaded with an anxiety. The dream is that Turkey will be admitted to the European Union. ‘Then we can travel freely,’ they say. ‘Then I can see your country.’ To our astonished irritation we learned that Turks cannot travel freely to Britain. They need visas which are not easily granted, whereas our visas for Turkey are a formality and a useful source of income for the Turkish government. But Turks seem to be treated with suspicion as if they were all potential stowaways and welfare cheats. As I write there is talk of change. Until then it is difficult for Turks to visit the Europe of which many long to be part. How European is Turkey? The answer must vary in a large country. It is easier to confine the answer to Istanbul. Before answering the question we have to consider what we mean by European. Perhaps there is no one model of what makes a European city. Europe is a collection of divergent cultures, often seen in terms of historical conflict. We think historically of Europe as Christian. This is generally true, but we cannot forget the deeply rooted presence of Islam. A legacy of the Ottoman Empire are the Muslim communities, centuries old, in Eastern Europe. They are not recent arrivals. They have not migrated. Further back was Moorish Spain. There are Moorish or ‘Saracen’ ancient trading posts on the southern French coast all the way to Italy. Islam may be a minority experience in Europe, but it is not alien. 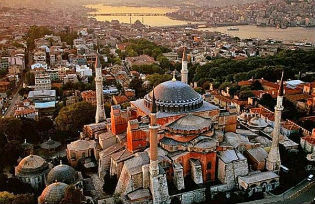 In that respect Istanbul is culturally as well geographically in part European. The urge for acceptance may heard with sympathy in a more secure and peaceable time, were such a time ever to be possible. There are problems of course concerning civil society and electoral democracy in contemporary Turkey. Europe aspires to the enlightened virtues of tolerance and accountability in its polity. Without such an aspiration, with evidence, Istanbul must remain for ever at the crossroads, unable to build on its Byzantine heritage and defined by an Ottoman legacy in ways that the European empires have forsaken in the modern world. Istanbul is changeable, a city that moves across continents and histories. That has given it a singular and invaluable character. It is a city at the centre of the world. Currently it trembles in uncertainty. Its extraordinary history has seen it the capital of empires. As I write the fragile stability of Turkey has been broken by civil disorder and state oppression. Wars on its borders and the threat of terror have disturbed the hopes that Istanbul in better times can offer. The need is for peace in a time of global conflict where the fear is that all the bridges are broken and all the cities destroyed.